Riddell will outfit elite high school football players from across the country in a selection of newest protective equipment for the Semper Fidelis All-American Bowl on January 5. For the second year, Riddell is the official protective equipment partner at the annual matchup of top high school football players from the East and West. This year, the brand is providing the Riddell InSite Impact Response System, a newly released integrated monitoring and alerting tool designed specifically for the proactive protection of football players at the youth and high school level. The Semper Fidelis Bowl players were chosen not only because they are some of the most talented high school football players in the country, but also because they exemplify the Marine Corps values of honor, courage, and commitment. In recognition of the importance and value of such traits, Riddell will deliver on the athletes’ gear needs from Power® SPX shoulder pads and Power® Padded Girdles to Revolution Speed helmets equipped with InSite technology. Riddell’s in-helmet installation of the InSite Impact Response System answers the call from this new generation of football elite for equipment that is rooted in equal parts protection and performance. The brand will donate 25 helmets to each squad that are equipped with this latest head impact monitoring technology from the company. Riddell developed InSite based on its Head Impact Telemetry System (HITS) and Sideline Response System (SRS), a technology that has analyzed nearly two million impacts since 2003. InSite is designed to alert coaches and sideline staff when significant single and multiple impacts (within a seven day period) take place during a game or practice, and offers a unique vantage point inside the helmet at the time of contact to enable improved identification and management of concussion. The Semper Fidelis All-American Bowl will be broadcast on Fox Sports 1 on Sunday, January 5 at 6:00 p.m. PST. 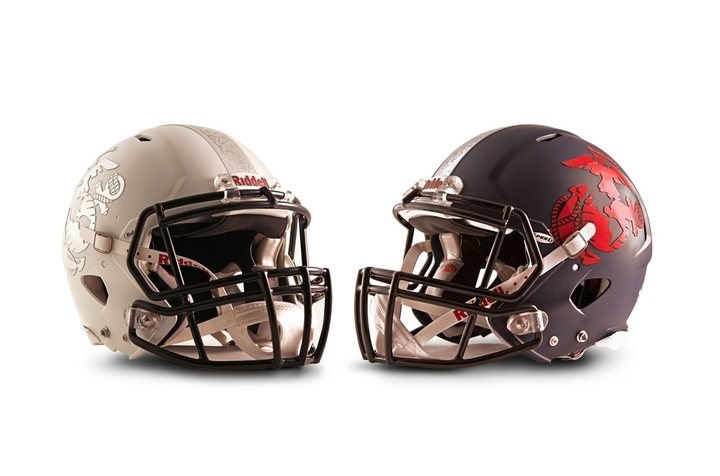 To learn more about the Riddell equipment that will be in use during the game, visit www.Riddell.com. Founded in 1929, Riddell is a premier designer and developer of protective sports equipment and a recognized leader in helmet technology and innovation. One of Easton-Bell Sports Inc.’s most well-known brands and the Official Helmet of the NFL®, Riddell is the leading manufacturer of football helmets, shoulder pads and reconditioning services (cleaning, repairing, repainting and recertifying existing equipment). For more information, visit our website at http://www.Riddell.com, like the Riddell Facebook page, or follow Riddell on Twitter @RiddellSports.